The Hiden HPR-20 EGA gas analysis system is configured for continuous analysis of evolved gases and vapours from thermogravimetric analysers, TGA. An extensive range of MS inlets for optimised coupling the HPR-20 EGA mass spectrometer to TGA systems is available. The TGA interface includes re-entrant furnace sampling, providing close coupling to the TGA furnace region for optimized evolved gas/vapour analysis. The coupling interface includes bespoke cables connecting the TGA and MS for TGA-MS synchronized data acquisition including automatic start / stop with TGA operation. Most popular brands of TGA are accommodated within the extensive range of coupling interfaces, including multiple models covering both the very latest new TGA systems, as well as older style legacy systems. The HPR-20 EGA system includes EGAsoft PC software, an application specific software program designed for TGA-MS, including data export in formats to suit direct import of MS data into the TGA equipment software. 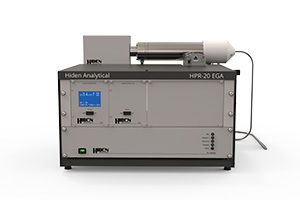 The Hiden HPR-20 EGA is a bench top mass spectrometer with QIC (quartz inert capillary) that samples from 100 mbar to 2 bar gauge and is included as standard. The HPR-20 EGA system includes an external dry scroll pump to provide for high performance combined sample bypass and UHV foreline pumping, providing fast response and effective pumping for light gases. Effective pumping for light gases enables the use of helium as the carrier gas for TGA-MS studies without compromise to sample flow and response. The benefit of using helium as a carrier gas of choice for TGA-MS studies is the reduced mass spectral interference with helium, compared to nitrogen or argon for example. The HPR-20 EGA system has mass range 200 amu (300 amu option) and with a detection capability from 100% to less than 100 part-per-billion. An extensive range of MS inlets for optimised coupling the HPR-20 EGA mass spectrometer to TGA systems is offered to suit an existing TGA, or OEM partner TGA equipment. Custom designed interfaces are available for special requirements with alternative systems being offered for applications requiring direct sampling from advanced thermogravimetric analysers operating at higher pressures to 30 bar. AP-HPR-20-0006 – Multifunctionality of silver closo-boranes.